Comparison of Eupsilia morrisoni and devia. Specimens and photograph from J.B. Sullivan. Comments: A genus of the Northern Hemisphere with some 17 described species, including 8 in North America, with several more about to be described. 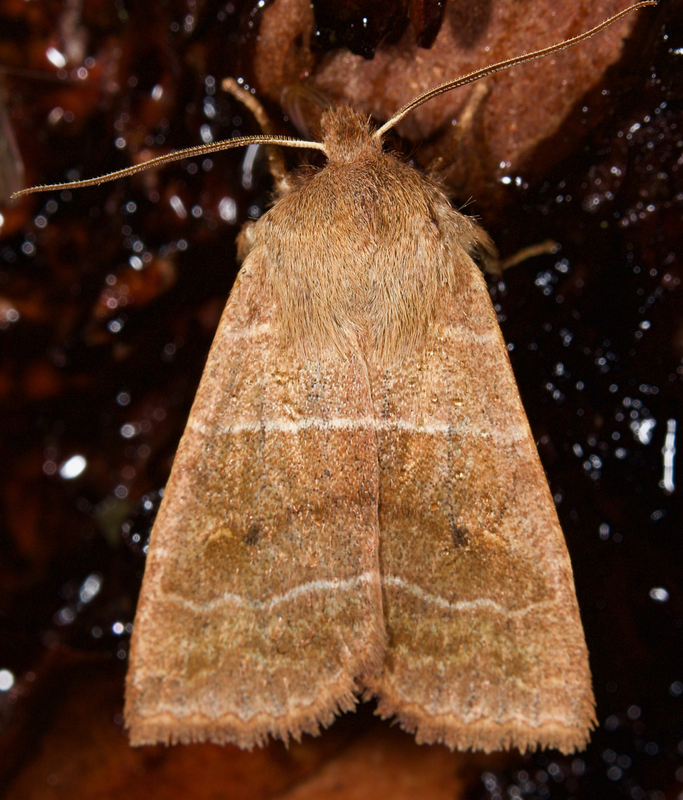 North Carolina has 6 described and 1 undescribed species, some of which are extremely similar in wing pattern. Species Status: Specimens of this species from North Carolina and elsewhere in the East barcode with specimens of E. vinnulenta, attesting to the close relationship of these two species. 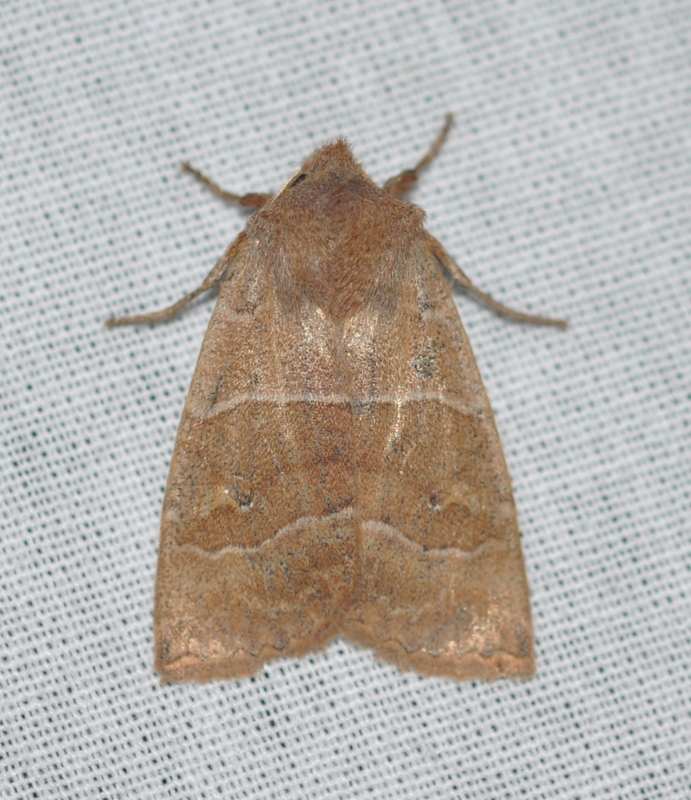 Adult Markings: Like E. devia, Eupsilia morrisoni is fairly easy to distinguish due to its fairly even, non-dentate postmedian line (Forbes, 1954). Fresh specimens are leathery-brown but worn specimens in the spring are a much faded brown or tan. The transverse lines are pale and well-defined. The antemedian is strong and runs straight across the wing, similar to most species of Eupsilia but not as oblique or as concave as in devia. The postmedian is even to slightly waved, especially towards the costa, but is never dentate as in the other species of brown Eupsilias. The straight pale line characteristic of devia that runs between the postmedian and subterminal is missing, and the subterminal is fairly weak and irregular. The reniform is a narrow yellow lunule (or with no filling), and has a dark dot at the lower end. The sexes are similar. Adult Structural Features: The male genitalia of our Eupsilia species are very similar. The proximal curve of the juxta has a slight medial projection. In the female the bursa has 4 signa and the ostial plate is slightly veed at the distal end and squared at the proximal end. Adult ID Requirements: Identifiable from good quality photos of unworn specimens. Immatures and Development: Eupsilia larvae are all similar to one another: variable in color; a narrow spiracular stripe usually the most prominent but with other lines also present; a darkened prothoracic shield, usually with two pale stripes. Wagner et al. (2011) recommend that larvae be reared to adulthood in order to determine the species. Larvae ID Requirements: Identifiable only through rearing to adulthood. Habitats: Most of our records come from stands of upland hardwoods growing on dry slopes and ridges. A few also come from wet-to-mesic riparian or lakeshore forests. Larval Host Plants: Polyphagous. Larvae have been found on a wide variety of woody plants but preferences have not been documented anywhere in its range. Wagner et al (2011) list Scrub Oak, Sugar Maple, Viburnum, Sweet Gale and Wild Strawberry but no preferences documented. Observation Methods: Adults readily come to bait and they also appear to come fairly well to blacklight traps. State Protection: Has no legal protection, although permits are required to collect it on state parks and other public lands. Comments: This species ranges across the entire length of the Mountains in North Carolina and at least sparingly in the Piedmont. With its wide range of host plants and use of a fairly broad range of forest habitat types, it appears to be secure within the state.